Smoked almonds paired with creamy Carnation are the secrets to this extra-special Smokin’ Almond Blue Cheese Dip. 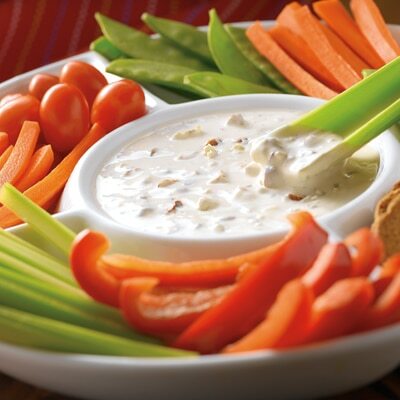 Use in place of the typical Ranch dip to serve with chicken thighs or wings, fresh veggies or hearty crackers. It’s the perfect addition to any party buffet table. COMBINE sour cream, mayonnaise, evaporated milk, almonds, cheese, vinegar and black pepper in medium bowl; cover. Refrigerate for 2 hours before serving. Makes about 2 1/2 cups. SERVE with assorted cut up vegetables or chicken wings. •	To use as a dressing, increase evaporated milk to 1 cup.